This 55 year old patient came to our clinic in hopes of adding density on the frontal hair line. 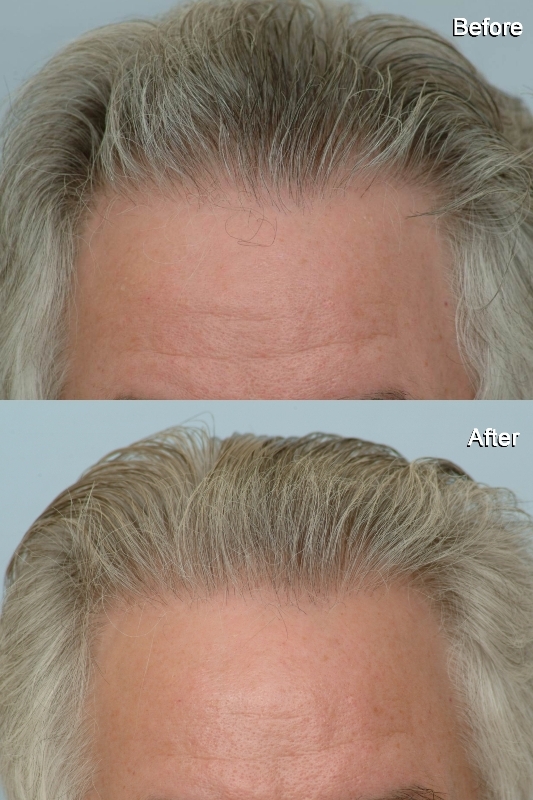 Before coming to Dr. Cole, the patient had a scalp reduction performed in the mid 90’s and was a class 3. The patient’s donor density measured about average at 180 hairs per square centimeter. During June of 07’ this patient received a combination of non-shaven CIT and strip (FUT) grafts for a total of approximately 800 grafts. As you can see, the growth on the hair line has added more definition with a soft appearance. The hairline is suitable for the patient’s narrow facial features and properly designed by the placement of single hair FUs. All patients must have strict goals concerning the hair line placement from the time of the consultation until the hair line is established. Hair lines are usually permanently sited and any removal of the hair line is an irreversible task for some clinics. We repair many patients who are willing to share their experience for the benefit of other sufferers. » (FUT) grafts for a total of approximately 800 grafts. » facial features and properly designed by the placement of single hair FUs. » willing to share their experience for the benefit of other sufferers. » » density measured about average at 180 hairs per square centimeter. » » (FUT) grafts for a total of approximately 800 grafts. » » willing to share their experience for the benefit of other sufferers. I must concur. The hair line is a fine line and is the most difficult area of the scalp in regard to placement of grafts. » » » density measured about average at 180 hairs per square centimeter. » » » (FUT) grafts for a total of approximately 800 grafts. » » » willing to share their experience for the benefit of other sufferers. » area of the scalp in regard to placement of grafts. Last question. What would be the follicular density of this patient’s results? » » » » density measured about average at 180 hairs per square centimeter. » » » » (FUT) grafts for a total of approximately 800 grafts. » » » » the time of the consultation until the hair line is established. » » area of the scalp in regard to placement of grafts. This patient’s hair line should be about 40+ FUs per cm2.